With the arrival of summer (here in the southern hemisphere) comes the desire for ice confection or ice blocks. We know that most frozen confection on a stick is full of sugar, preservatives, artificial flavours and colours and usually has no nutritive value whatsoever. But how do we avoid the constant pestering by our little ones for a frozen treat on a hot day? 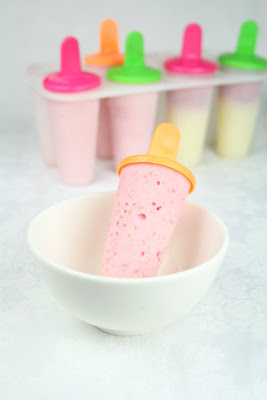 Home made ice and creamy treats are very easy to make and can provide a healthy solution to the commercial varieties. Using fresh fruit provides a sweet alternative to pure sucrose. Kids will be unaware that they are having vitamin C and fibre whilst they enjoy the sweet taste. Kids look for something cold, sweet and brightly coloured, so here are a few solutions to have up your sleeve. Using a melon baller scoop out 12 balls from each melon. Buying fruit in season not only tastes better but is more economical so when certain fruits are in plentiful supply, buy up big and freeze for use over the next few months. Most kids love to help in the kitchen so get them involved with making their own sweet treats. My boys have 'rockets' nearly everyday and we make ours the same as your yoghurt ones. They love them!